If you download and install the unofficially leaked Windows 10 Build 10147, you may face with the issue that Windows Update does not offer new insider builds to you, hence you cannot download and install Windows 10 Build 10158, one of the most stable Windows 10 build to date. 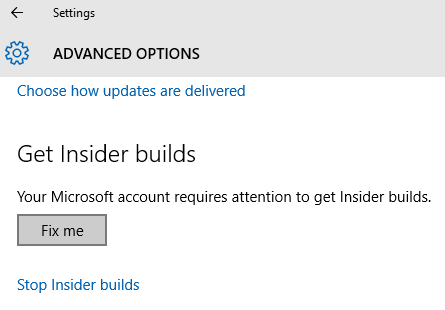 It also appears that the Insider builds ring which determines how you get Insider builds in Advanced Options of Windows Update is stuck at Slow or Disabled. If you attempt to change to “Fast”, it will revert back to “Slow” automatically once you check for updates. In addition, Windows 10 also pops up notification from Get Insider builds app that Insider build settings need attention. On click or tap, it will bring you to Advanced Options of Windows Update. If “Fix Me” button is available, it does nothing to resolve the no new Windows 10 Insider builds problem. Here’s a trick that may fix or at least workaround the issue of Windows Update kept reverting to Slow ring, and allow Windows Update to offer the Windows 10 Build 10158 or later as update option. Try to check for update. If Windows 10 Build 10158 update in the name of fbl_impressive Professional Build 10158 is still not available, try to change the following registry value to empty string by removing the content of its data. Then check for updates in the Settings app again. No reboot is necessary, and if it works, it will download the new builds automatically. The above trick may not work for everyone, especially if you’re clean installing Windows 10 Build 10147. In this case, you can install Windows 10 Build 10130 with official Windows 10 Build 10130 ISO, or revert your Windows to previous build or version through Settings app -> Update & security -> Recovery.